I have really struggled with understanding what I need to write about this week. It seems much harder, which is probably a great reflection of the rollercoaster week it’s been. It’s not as though there has been anything too dramatic regarding Mum’s health – I think that we’ve all accepted (including Mum) that it is declining whether we like it or not. For Mum is it the slow (or rapid, depending on how you look at it) letting go of independence, and the accepting of dependence. “I don’t want to be a bother,” she says to the doctor, the specialist, and anyone else who is there. We are all tired, but that isn’t going to stop us. I had a few days this last week where I didn’t see Mum, and in the end it felt excruciating. The pain of our reunion, the pain of seeing the decline from those three days was almost too much to bear for both of us. Seeing her seven days ago, unable to communicate with her body or me, threw me too far out. I had to leave her with someone so that I could attend an important appointment for myself. When I entered the neurologist’s waiting room, I was greeted by a woman in uncontrollable grief having lost her dad four days prior. The words she said could have been mine after Dad died, or mine in the not to distant future. I spent the rest of the day collapsing into tears – on the train, walking to my appointment, on the train, in my uni class, on the train (yet again). When I saw her that afternoon she had returned to her jovial self (this seems to be close to the new normal, a slow start as she warms up to her day), mucking around with my sister. It was hard hearing my husband join in with the flippant mood that I can’t seem to get to. I was no good to anyone during those days I didn’t see Mum after that while I tried to catch up on my uni work. Her and my husband’s pragmatism felt too difficult, and at odds with my pain, so I internalised it. And yelled at my kids and husband (Why oh why do we always take it out on the people who we love most?). Mum and my reunion was teary. It ripped me up knowing that I had cut myself off from her for so many days. It hit hard seeing her moving so much slower than she had only a week ago. 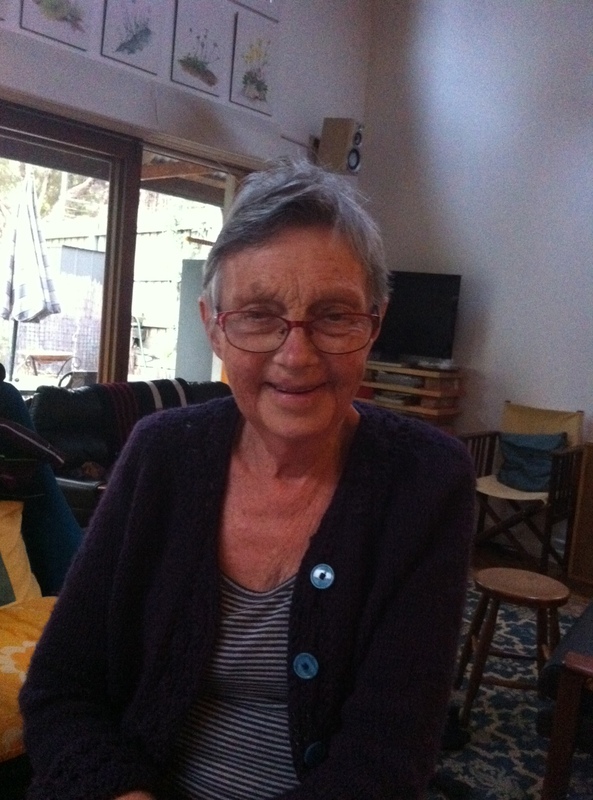 Mum is still positive about the end of her life, but there is a sadness now. “I’m a bit more teary,” she said. It is hard to escape the finality of this retched illness. Conversations now revolve around medications and physical response, care plans, and finishing things off. I have an unfinished cardigan to complete that she began, and she is racing to finish a crochet rug. My sisters are trying to learn how to do the rug in case she can’t finish it. While my siblings (and partners) and I have our different roles to play in helping, we all want to be there all the time and do everything, but we can’t. Our ‘normal’ lives tear us back, kicking and screaming. The pressure of these lives seems to have increased, not decreased. But when I see Mum, there is a sense of relief, an easing of the pressure, and the words I have to keep telling myself at all other times – “don’t panic” – disappear. This is the fifth post in a series about my mother’s journey with terminal cancer.